Each box is clickable, and each of those tiny triangles will collapse or expand each group. Once you have all your scenes set up this way, then writing the book is just like filling in the blanks! Well…it is almost that easy. What is the Navigation Pane? It is a map of your document. 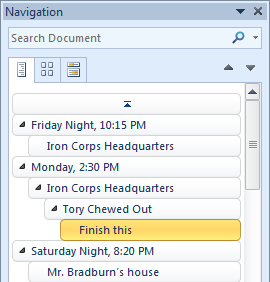 You can bring up the Navigation Pane up by clicking the View ribbon across the top of the Word window, and in the second group from the left (called “Show”), click Navigation Pane. I previously wrote about this subject in a post on my old writing blog called The Magical Document Map. If you still use Word 2003, follow those instructions instead. To set this up, you first have to get to know Word Styles. And to do so, you need to check out the Styles section of the Home ribbon. This is the way it looks by default. The best way to begin is to start with the default styles, which appear in the first image above, and change them to look (and act) the way you want. If you want your chapter headings centered, be sure to select that option as well. The bottom half is a bit more involved. 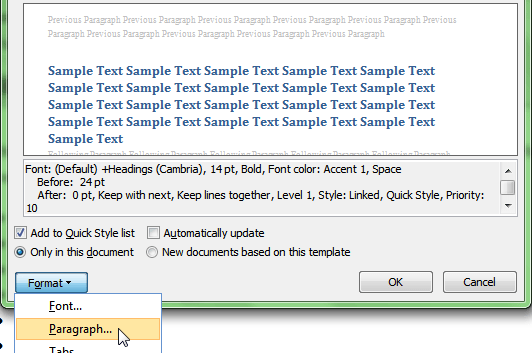 Make sure the Quick Style list option is selected and click Format, then Paragraph. 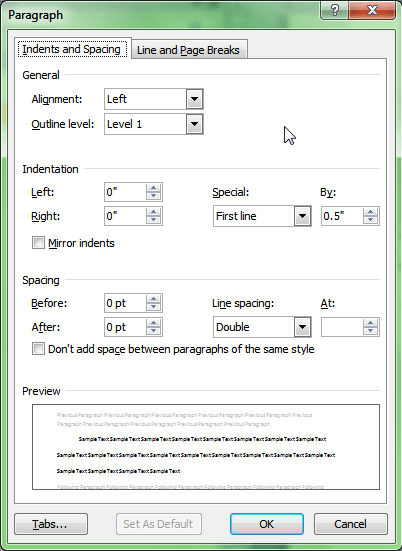 For standard manuscript format, select all the options above. The only thing I had to change was Spacing Before to 0 and Line Spacing to Double. I still find it easier to read double-spaced manuscripts, but change to Single if preferred. Take note of the Outline Level. You’ll be changing these for your other styles below. Scene – each chapter is made of one or more scenes, so this should be your next level. It is very helpful to name your scenes even if you don’t keep them in your final copy. I almost never do. Sometimes, I keep chapter names, as I did for The Sevenfold Spell. In that case, the chapter name was at the second level. POV – If your book has multiple points-of-view, this is most useful under Scene. This is because POV breaks are more likely to occur within scenes. ToDo – these can be anywhere, so I have them at the lowest outline level. It is perfectly OK if it appears directly under a chapter, or any other heading. I also find it helpful to set up a style for Centered text, and a First Line style for the first line after a chapter break. To create one of these, create a style, click the Paragraph button on the dropdown at the bottom of the Style form, and in the Paragraph form, look for Indentation. And that’s it. 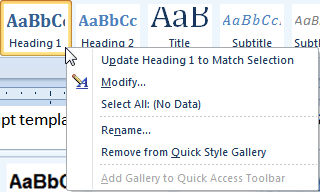 I then get rid of all the other styles by right-clicking them, and then clicking “Remove from Quick Style gallery.” When I’m done, only my special styles appear in the Styles box on the ribbon. Very convenient. What books have I written this way? Well, almost all of them. I’ve been using some variation of this technique for over ten years, now. Only my very first novel, the trunk novel that pre-dated the existence of the Document Map in Word, was written without it. Back then, going back through the manuscript to look for a scene that needed to change was unbelievably laborious and time-consuming. Using Word styles in this way has been tremendously helpful. What do you think? Want to give it a try? If you have any questions, just leave them in the comments, or email me at tia (at) tianevitt (dot) com.